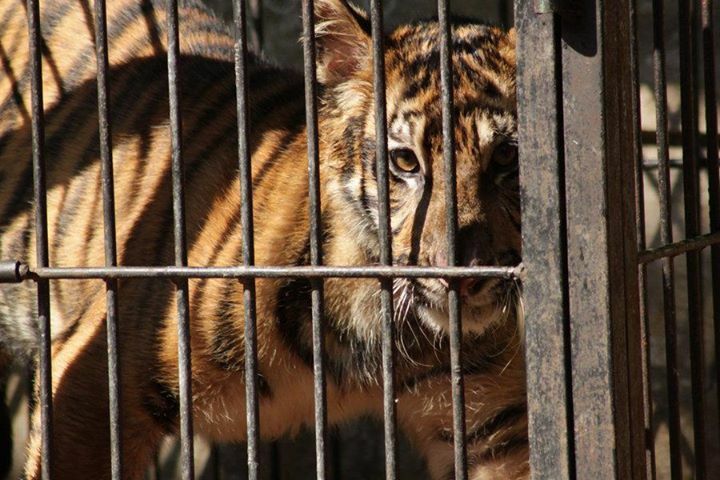 The Tiger in a Cage: Why? We being locked up, not you. Girl: but it makes me uncomfortable to see you locked up. You should be in the wild. Tiger: So you want to avoid being uncomfortable by not coming to the zoo to see us locked up in cages? Girl: yes. Why would I pay to do something that makes me uncomfortable? Tiger: But we would still be locked up in cages even if you stop coming to the zoo. Why not release us? That way we can be free, and you can be comfortable knowing that we are no longer locked up in cages. Girl: …because I can’t do that. Tiger: Why can’t you? You’re free!!!! You’re not in a cage! You’re not disabled! You’re perfectly free to go grab the key and unlock these cages. Girl: I cannot do that. If I do that I will be punished…and how I can be sure that you will not hurt me? Girl: Can you promise me that I will not be punished if I unlock your cage? Tiger: I cannot make such promises little girl. It is not within my control. Girl: Can you promise me that you will not hurt me? Tiger: I can say that I will not hurt you now. I can say that I will try my best to avoid hurting you. But I can never be 100% sure that I will never hurt you. The future is also not within my control. Girl: Then I will definitely not unlock your cage. Tiger: What would you like me to say little girl? That I will never hurt you and that I will protect you from the punishments? Tiger: but those are empty words! Girl: But they would at least comfort me. Tiger: But they are lies… Would you like me to lie to you little girl? Girl: …. because you’re a tiger, you can kill me later… I don’t want to risk my own life for you. Tiger: Why are you crying? Girl: because I feel so sorry for you. Tiger: Don’t fool me with tears. If you really feel sorry for me, you would have already set me free. Girl: I already told you… I can’t do that. I have calculated the risks and it will be safer for me to leave you here in a cage and walk away. Move on with my life. Tiger: You’re so cruel little girl. Girl: But Tiger, you’re being fed well here in the cage. People come here every day to admire you. You’re like a star here. You should be happy and forget about the wild. Tiger: No one can forget what it’s like to be free little girl. Girl: But it would be good for you if you can forget. Girl: Isn’t this good Tiger? You have no problem at all in your life! Everything is sorted out and organised for you. Tiger: So my only duty in this world is to breathe air? That’s not living little girl… it’s not death, but it’s not living. Tiger: thinking is what differentiates me from others. I am a tiger that likes to eat wild boars; I like to swim, etc. By being locked up in a cage and doing what I’m told, I’m just a tiger in a cage… a prisoner identified by numbers and a name made up for me. Girl: I have no problem with that at all! I won’t have to struggle with my life. I follow the path that someone’s already made a road for me to travel safely and easily. I eat the food that is prepared. It would be a worry-free life! Tiger: but you also have to fear punishments when you don’t do as you’re told. You’re in no better situation than me. You can’t do what you want… you have been taught not to want anything apart from what is available to you. Are you happy? Girl: …. well I am not sad. Tiger: You’re also a prisoner little girl. … A prisoner who is happy in her cell. Tiger: You’re leaving because you cannot set me free. Remember that you wanted to save me little girl, but you can’t. Now you will leave me and never come back because you feel uncomfortable and guilty seeing me in a cage. Girl: By tomorrow I will have forgotten you already Tiger. You’re just another Tiger in the zoo. Tiger: …I am a tiger that wants to be free little girl, and that’s what makes me different. I am a prisoner now, but there is a possibility that one day I can get out of here. There is a lock on this cage, and there is a key to it. Tiger: But you, my dear little girl… you will leave the zoo today… you will take home with you the realisation that you’re not free to do what you want. You wanted to save me, but you can’t. You saw something wrong, but you can’t fix it. More accurately, you saw something wrong that you can physically fix, but you won’t… why? Why little girl? Because you now know that you’re not free. Something is holding your mind captive. You will go home realising that you’re a prisoner. Girl: …how can I be free Tiger? Girl: but I am not in a cage. Tiger: But you…you’re the most pitiful prisoner of all. You’re sad because you see me locked up in a cage, and you can’t get rid of this sadness because you won’t allow yourself to do so. You want to be happy, but you won’t allow yourself to get rid of things that make you unhappy. Little girl, your prison is your mind. Tiger: and you’re the most pitiful prisoner of us all… because your cell didn’t come with a key. Question 1: does your prison come with a key? Question 2: If it does, will you set yourself free? Question 3: Do you even know for sure if you’re in a prison or not? Perhaps Mr. Tiger has a better chance than all of us….